If you do any research on Mount Sherman, you will read how easy it is - just a walk-up, no challenge, anyone can do it and more. It is close to the lowest 14er at number 45 out of 54. So on a crisp Sunday morning in early October, Patrick and I decided to give it a go expecting we might run into some snow thus increasing the fun a little. Yes, it was as easy as advertised but it was also one of the most educational 14ers I have climbed. Getting to the Fourmile Creek trailhead is a straightforward drive on a reasonably rocky jeep road outside of Fairplay. 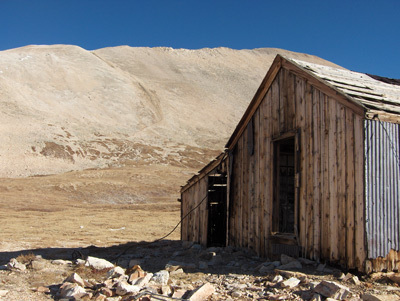 We choose to drive to a gate at 12,000' that blocked the road just below the Hilltop and Dauntless Mines. Sherman loomed ahead and two sturdy 13ers stood guard on either side - Mt. 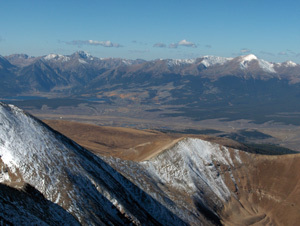 Sheridan at 13,748 and Gemini Peak at 13,951. The route starts on the jeep road and climbs sharply for 300' to the Dauntless Mine. The rest of the route up Sherman is obvious as it switchbacks to the saddle with Sheridan and follows the skyline north to the summit. 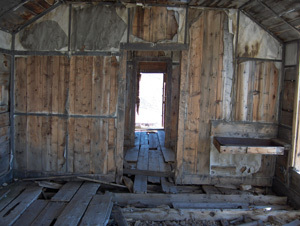 As we scouted the route, it was the old mining buildings that caught our attention. The Hilltop mine was quite an operation in it's heyday yielding over $600,000 in silver ore in 1888 (about $9 million in 2005 dollars). To move all the ore to a mill downhill in Leavick tey built a 13,000-foot-long aerial tram. It had one hundred twenty-five ore buckets each carrying four hundred pounds of ore. It must have been a sight in full operation in those days! We explored some of the building carefully since they are rotten and have false floors. If you want to read more about the history of these mines click here and here. The wind was blustery at times and the temps hovered in the low 50's but there was not a cloud in the sky as we left the mines and climbed towards the saddle. Once a top the ridge, the wind picked up. As we reached 13,500' it almost knocked us off our feet. Soon we made it to the summit where, amazingly, the wind was mostly calm! We were treated to another wonderful view. Patrick stopped counting when he named 30 14ers in clear view. Snow was already starting to get established on the summits of Mts. Elbert and Massive off to our west. 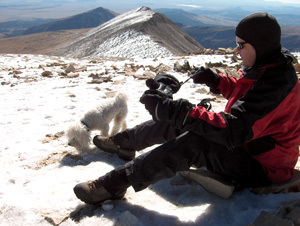 We were sharing the summit with a couple of climbers and enjoying the peaceful setting when the the smallest dog I have ever seen on a 14er summit appeared: Abby, a Bichon Frise, along with her owners Kim and Steve. She proceed to greet everyone with a long series of yaps that went on and on. Actually she was cute and a welcome change from the normal Labrador Retrievers I see on 14ers. 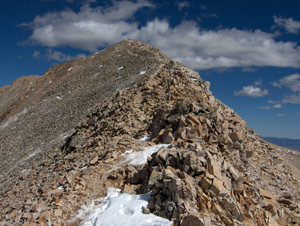 I took my normal summit video but we were feeling a little guilty that we had only spent an 1:45 to reach the summit of a 14er so we soon left for Gemini Peak an impressive 13er with a hundred foot pile of rocks as a summit. The winds battered us again as we made the short hike across the saddle and we hunkered down in the rock pit that seems to be a top every 14er in Colorado. After a relaxing time in the pit, we traversed back to Sherman and back down to the mines and on to the car. We passed several parties still coming up even though it was well after 2:00. Luckily this is usually not a problem in October since the chance of thunderstorms and lightening is low plus it was still a great weather day this Sunday. So Sherman is not the highest, hardest or even a full day. But it is interesting, inspiring and a lot of fun. If you are looking for your first14er or something different from the day long slog through scree, Sherman is a great choice.